Do you have a little late talker who has a hard time listening to you, paying attention, and staying with you as you try to talk to him and teach him new words? This a problem with joint attention. Joint attention means that a child learns to share experiences with you. 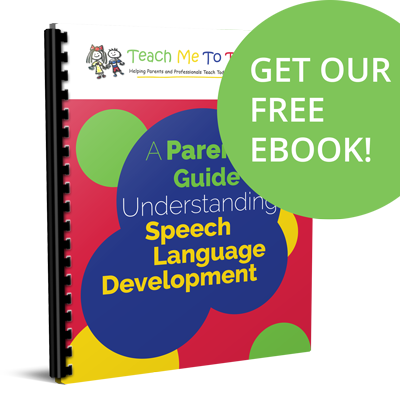 It’s one of the prerequisite skills toddlers master before they begin to understand words and communicate. One of my first strategies for teaching joint attention is using a highly enticing toy like a light up spinning wand like this one. We have to begin with things kids like. We have to give them reasons to want to be with us. When you are a few feet away from a child, hide an interesting object behind your back. Toys that work well for this are wands that light up and spin or any other object with an interesting visual effect. If a child approaches you and wants to play with the item, let him! Your goal is for him to share an experience with you! Stay together and continue to hold the item so that he will include you. Talk about the toy as you play together since this is your overall goal. Eliminate any other distractions in the room so that you are the show! Turn off the TV and put away any other toys. Try a different object that’s more interesting to the child. If a child insists that you give him the toy, try to keep yourself involved by talking with him about the toy. 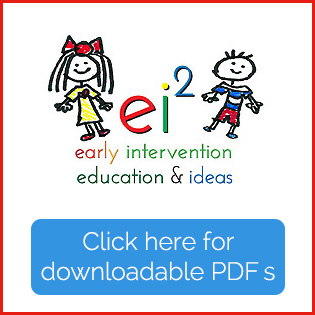 Make comments as you point out different parts or show him how to use the toy in a new way. Or pick toys that a child can’t activate on his own so that he needs you to play. Maintain some control of the toy or object so that you are not excluded. Do this by staying in very close proximity of the toy and the child. Keep your hands right there in the mix too as you play together with the toy. Leave the toy between the two of you on the floor or table. Allow a child access to do whatever he wants with the toy, but not full control. This will make it easier for you to stay involved and for him not to turn his back on you and leave you out. If he moves away from you, do not let him take the toy! You’re teaching him that he must stay with you to play. In some cases, you may have to keep your hands on the toy to prevent a child from taking the toy and leaving, but only do this as a last resort. Even then, keep your voice and face happy so that it doesn’t look or sound like you’re in a power struggle! Don’t just sit there! Take a turn with the toy as the child plays. Teaching joint attention means that you participate in playing with the toy too. You cannot just sit there with your hands on the toy guarding it to be sure she doesn’t get away! That’s not purposeful or productive and will not promote playing together. Take a turn and keep yourself involved! Remember – your goal is to teach him to want to be with you so he can learn from you! These are excerpts from my new book Let’s Talk About Talking. 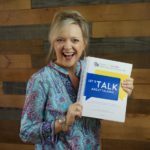 In that book, you’ll find lots of discussion for not only what to do to help a child begin to talk, but how to handle the missteps that are sure to occur along the way! 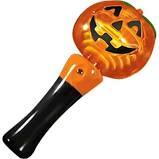 If you’re interested in where to buy the Halloween toy, here’s the link to Amazon. You can find LOTS of these toys almost anywhere toys are sold, especially this time of year!